Upcycled cobweb detailing vest, multi-tier upcycled cotton shorts (used as petticoat), both from Bias, New Delhi. Printed silk skirt, from Gucci; black ruched silk top, from H&M; pearl stud, from Dior; vintage gold earring, from Viange; champagne shoes, from Clarks. All in Mumbai. Socks, stylist’s own. 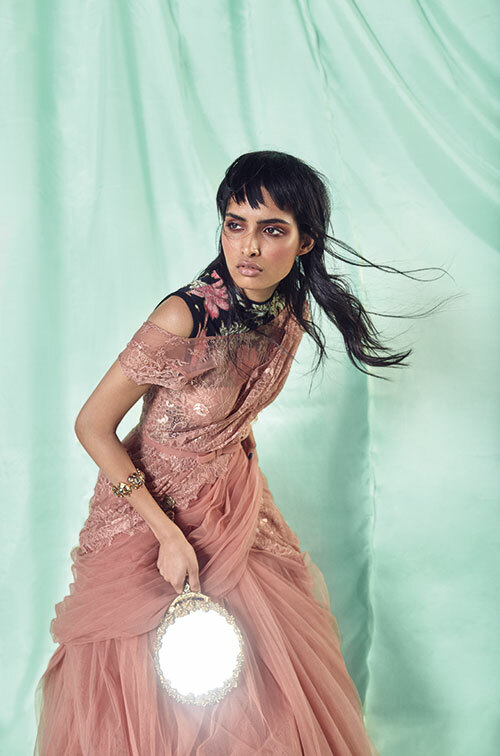 Fuchsia ruffled top, midi skirt, both by Sonal Verma, for Rara Avis; crimson headband, from Salvatore Ferragamo. Both in New Delhi. Rust brown T-shirt, otanical-print bag, both from Gucci; botanical-print teal pumps, by Christian Louboutin X Sabyasachi. All in Mumbai. Socks, stylist’s own. Ivory organza tunic, by Dhruv Kapoor, Gurugram. 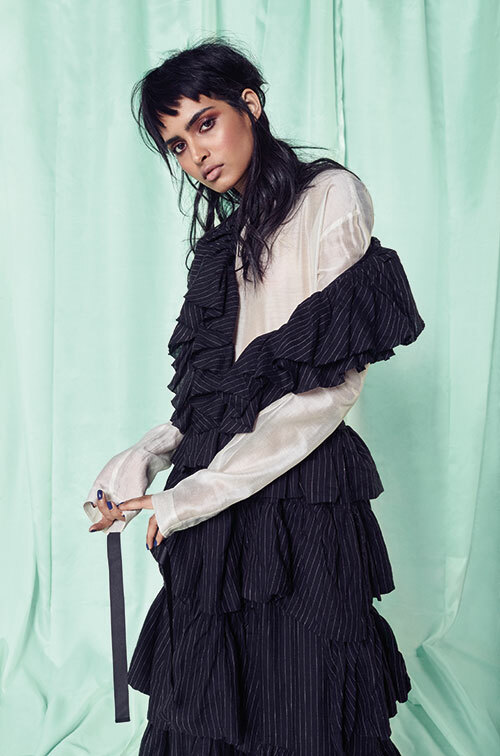 Pinstriped multi-tier ruffle dress, from Chola, Mumbai. Fuchsia asymmetric gown, by Gauri and Nainika, New Delhi. Custom-made tulle headgear, by Maiti Shahani; red fringed mules, by Christian Louboutin. Both in Mumbai. Socks, stylist’s own. Baby-blue beaded sheer dress, from Ilk, Noida. Ivory corset belt, by Dhruv Kapoor, Gurugram. Crystal earrings, from Swarovski; Sun tarot card clutch, from Dior. Both in Mumbai. Shirt dress, by SavioJon, Goa. 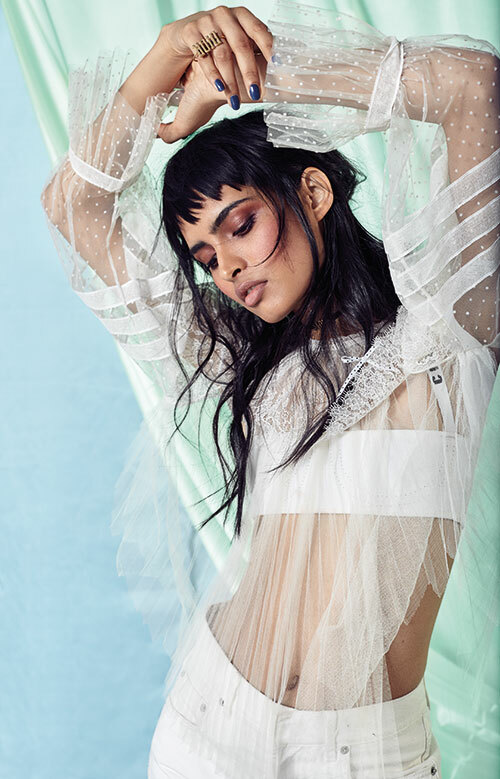 Ecru-dotted tulle and lace top, white knitted underwear, choker and Dior Revolution ring, all from Dior, Mumbai.